Botanical Name: 1. Lilium brownii var. viridulum Baker; 2. Lilium pumilum DC. ; 3. Lilium lancifolium Thunb. Bulbus Lilii is collected in autumn. It is washed, slightly scalded in boiling water, and dried in the sun. It is used unprepared or stir-baked with honey. Functions: 1. To moisten the lungs and stop cough; 2. To clear heat in the heart and calm the mind. 1. Deficient yin of the lung with excessive fire manifested as cough and hemoptysis. 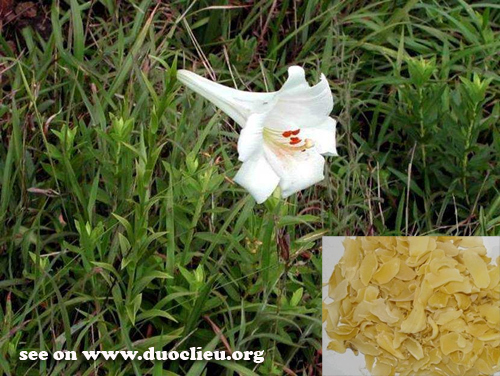 Lily bulb (Baihe) is used with Scrophularia (Xuanshen), Tendrilled fritillary bulb (Chuanbeimu) and Fresh rehmannia root (Shengdihuang) in the formula Baihe Gujin Tang. 2. The later stage of febrile diseases with residual heat manifested as irritability, palpitations, insomnia and dreamful sleep. Lily bulb (Baihe) is used with Anemarrhena rhizome (Zhimu) and Fresh rehmannia root (Shengdihuang) in the formula Baihe Dihuang Tang. Cautions & Contraindications: This herb is contraindicated in cases of cough due to invasion by wind-cold or diarrhea due to cold in the spleen and stomach.